As PAS128 becomes the standard specification for surveys, we’re getting more clients asking us how PAS128 survey types relate to the old survey levels set out by The Survey Association (TSA). Sam Roberts, Director of Geophysics and Utility Mapping at Met explains the similarities and differences between the two systems. Prior to PAS128, the best practice in utility detection surveys was outlined by TSA’s Essential guide to utility surveys. The recommendations outlined in this guide had been warmly received and there had been fairly wide adoption by both commissioning clients and survey practitioners. As you can see, the biggest difference is that all of the TSA levels requiring an on-site detection survey (levels 4, 5 and 6) are now contained within the PAS128 Survey Type B – Detection survey. But don’t worry; there are different methodologies within the PAS128 Type B survey that follow a similar hierarchical approach to the TSA level 4-6 surveys. The subtleties between the TSA survey levels 4 to 6 are accounted for in PAS128 by the different types of survey methodologies that can be employed when conducting a Type B survey (shown in the table below). The difference between a Level 4 survey and a Level 6 survey in the TSA scheme was whether post-processed GPR data collection was used, and this choice is still available in the PAS128 scheme. (Methodologies that use post-processed GPR data collection are denoted by a ‘P’) suffix). Why have one survey type with multiple methodologies? One of the main benefits of PAS128 is the flexibility it offers in designing a site-specific methodology to suit your requirements. 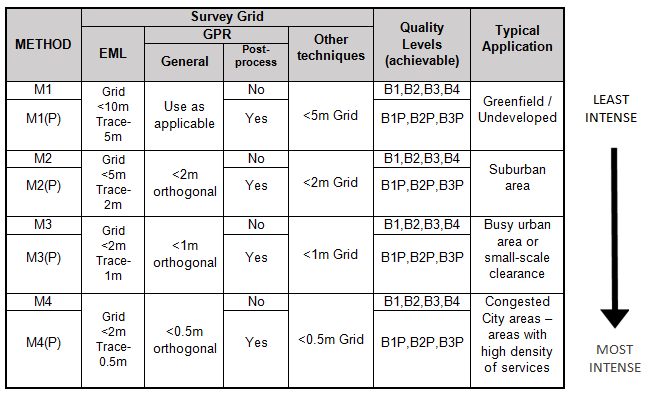 The series of methodologies [M1 to M4] relate to the intensity of the search grids employed in electromagnetic location techniques and GPR, and can be selected depending on the type of site and the information required by the client. The recommended density is related to the nature of the site, with a more intense search pattern suggested for highly congested areas, as opposed to undeveloped areas. What’s more, a combination of these methodologies can be used and deployed on a single site. For example, if surveying a school you might use an M2 or M3 method around school buildings, with perhaps an M4 used around utility service rooms or substations on site. An M1 method could be used on school playing fields if a low density of services is expected. Post processed data can be chosen to be collected on some, all or none of the site. How do I get a TSA level 6 survey in PAS128? The most comprehensive survey under the TSA scheme was the Level 6 survey, which involved a full EML survey (lifting manholes and inspection chambers and tracing all services) and 100% recorded GPR data. The density of the GPR survey that was recommended varied based upon the nature of the site in question. To replicate the TSA Level 6 survey you would need to specify that you want a Type B detection survey with post processing of GPR data. Discuss with your survey practitioner what intensity of search methodology would suit your site or, for large and varied sites, which methods should be employed in different areas. Whilst most companies will lift manholes and inspection chambers during a Type B survey, you should also specify that you require this as it is not automatic to the PAS128 Type B survey (although most reputable companies should offer this as standard). Visual inspection of manholes is classed as a Type A survey in the PAS128 specification, so if in doubt you should ask if your Type B survey will be supplemented by a Type A Inspection Chamber survey. It is always worthwhile to have a discussion with your survey practitioner in advance of any site visit to decide on the approach to be taken. This is part of the PAS128 process and helps ensure that you get what you need from the survey. 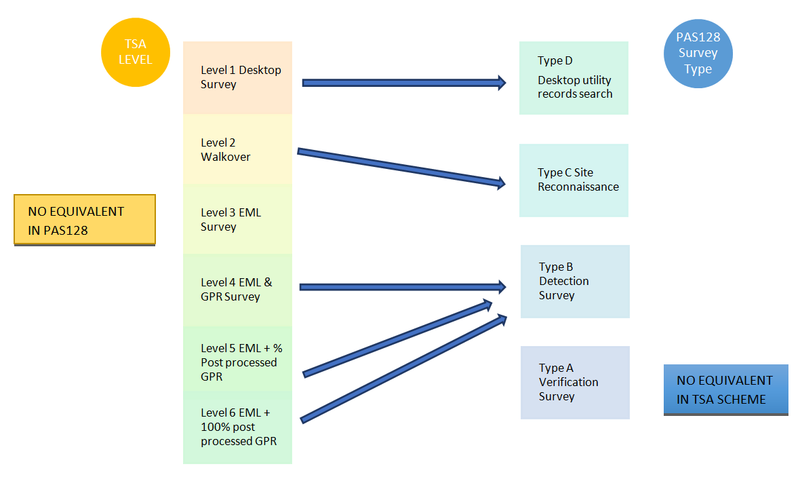 Fundamental to the PAS128 specification is that all Type B detection surveys require a desktop utility search (Type D survey) to be completed before the site visit. This should be a comprehensive search and not just restricted to the 5 main utilities; it should also have been carried out within 3 months of the site survey visit. The results of your survey should be displayed on accurate base mapping. A topographic survey is the usual practice for this, as OS mapping is not good enough for displaying Type B results due to its accuracy (unless it is augmented by additional topographic information relating to utility apparatus – service covers, lampposts, street furniture etc). A report should also be provided detailing what was done on site, the findings of the survey and any issues encountered.